A quick visit to Oslo, Norway The misadventures of a restless photographer. Travel photographer and travel blogger, Tracie Howe, wanders the globe seeking out new adventures and photo opportunities to blog about. Join her for a unique perspective on travel, travel photography, and travel tips. We arrived in Oslo armed with excellent and detailed instructions previously emailed by our now local friend, Havivah. She met us at the train station and walked us a few blocks to her incredible apartment in downtown Oslo. It is huge with high ceilings and windows which provided tons of lovely light. 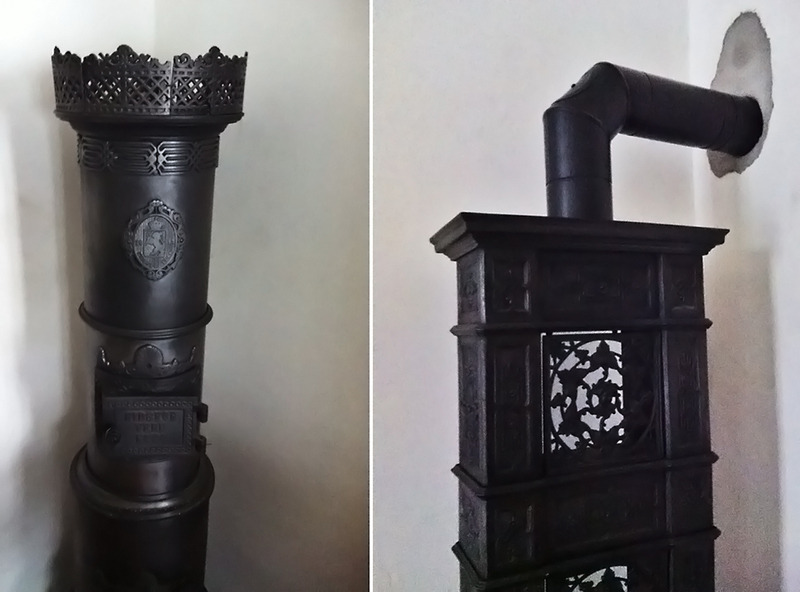 The intricate molding and fixtures were very interesting to me, especially the old wood stove that heated their home. And, of course, it was no surprise to me that our hosts, true foodies who love to cook, had an enormous kitchen. Fortunately for us, they put that amazing kitchen to use that evening and prepared us a delicious meal. With Reindeer as the main course, Chris and Havivah thoughtfully provided a back up of Turkey just in case I couldn’t stomach the other meat. Good thing that they did, but at least I liked everything else. After a surprisingly comfortable sleep on the most sophisticated air mattress I’ve ever spent the night on, Dave and I were off to the Viking Ship Museum, a place that I had wanted to revisit since my last trip to Oslo. 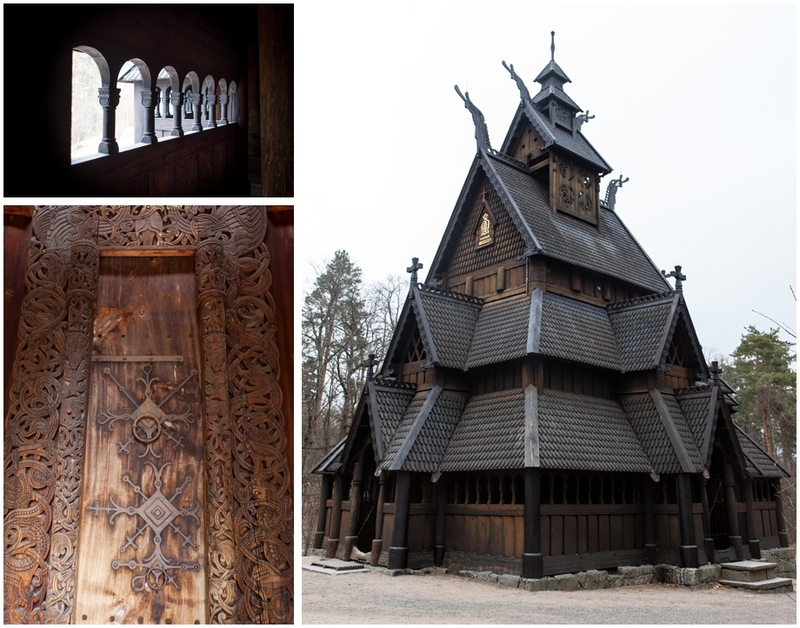 We continued onto the nearby Folk Museum, which featured a Stave Church, and many other historical buildings, some of which you could go inside. It was really an impressive display of old buildings and interiors, and even a barn full of animals. 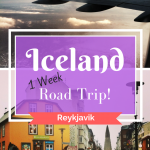 By the way, from here on out will be photos of this trip from my good camera, instead of my phone (with the exception of the last 3 on this post when I was getting lazy). Having already explored a bit of the touristy parts of Oslo the day before, we then met up with Havivah who toured us around some of the more eclectic areas that we may not have easily discovered without her. We picked up her daughter and roamed the unique city streets, stopping at a local market to buy a cut of whale for us to try later. We then met Chris at a very nice restaurant known for its local dishes with a modern spin. Everything I tried was delicious, but I can’t speak for the Steak Tartare which I didn’t try. I’m telling you, meat is the one thing I don’t like to experiment with. 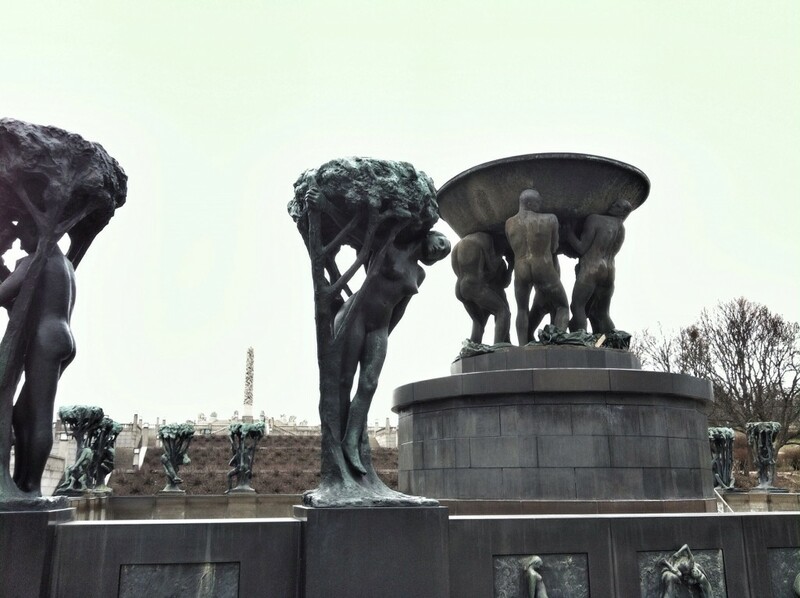 The next day left us with enough time before our flight to visit my favorite place in Oslo, Frogner Park, also referred to as Vigeland park. 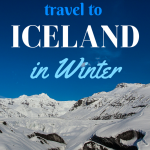 It features the work of Norway’s famed Gustav Vigeland, over 200 sculptures lining the center of the massive park. Each sculpted figure is so unique and emotionally compelling. It really is a must see for anyone visiting Oslo. With just enough time left on our 24 hour bus card, thoughtfully purchased in advance by our host, we returned to her home for a quick bite before leaving for the airport. This is when I actually tried a piece of whale, which has been described as something I would like, and something I’ve always been curious about. I admit feeling guilty about my tiny taste of whale, but I justify it with the thought that that little bite out of a living whale would not harm it in the least. Works for me! And by the way, it was pretty tasty. A fond farewell to our lovely and generous hosts, left us with our long and mostly uneventful flight home. The only thing about the trip that had a lasting impression on me was the little boy who sat in front of us. He was about 4 years old, and had barely made a peep during the whole trip, but as we were battling a little bit of low turbulence within 5 minutes of landing, he started throwing up. I felt really bad for him, but the smell was really getting to us. Finally, seconds before touching the ground he shouts, ” I’m going to die! I’m going to die!”. And then simply stated, “I’m dead”. Everyone in our row busted out laughing as quietly as possible, and it definitely took some effort on my part to contain myself. Poor little guy. But that was too funny! And a great ending to an incredible trip. Again, thank you for following along on our little adventure. I still have a ton of great photos to show, so be sure and stay tuned! Doreen Pendgracs - Oslo looks amazing! I love the weird looking building. Wonder if it’s haunted? Gabby | The Globe Wanderers - This is a great post and hadn’t actually looked into Oslo that much. You’ve certainly popped it on my radar now. Great pics and I especially love the historical building. Amazing!